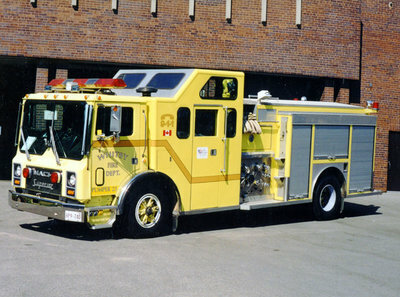 A colour photograph of a 1989 Mack MR688P pumper truck (Pumper 23) owned by Whitby Fire and Emergency Services. 1989 Mack MR688P Pumper Truck, July 20, 2002, Dean Nickerson. Whitby Archives A2013_020_006.